And at the end of each tour we ask our guests, which of the several cocktails they tried, was their favorite? Check back here often for recipes and pro tips from the mixologists who created them. Be cocktail curious and drink outside the box. Cheers! This cocktail was as delicious as it was beautiful and won fan favorite on our Sunday Funday tour. Combine all ingredients in a shaker and dry shake (without ice) for 10 – 15 seconds. Add ice and shake again until cold. Strain and serve up in a coupe. Garnish with a dehydrated orange slice. PRO TIP: For a vegan-friendly version of this, or any cocktail, that calls for egg whites, try using aquafaba instead. This weekend our guests could not choose a clear winner of our fan favorite but their top two both came from Sidebar. Alex’s “Widow’s Kiss” and Chris’ “Coki Beach Daiquiri” were both delicious and despite the fact they were both served to us in a coupe glass, they were complete polar opposites in style and taste — much like the Spring weather here in central Ohio. Shake, serve up in a coupe and garnish with a sprig of fresh mint. Shake, serve up in a coupe and garnish with fresh ground nutmeg. PRO TIP: Homemade simple syrup will make any cocktail better than store-bought and is quite easy to make. Here’s a delicious and easy recipe for coconut simple. This delicious cocktail was created as the perfect finale in our “I’m Not “Really” a Bartender” amateur cocktail competition. Barry (with Logan’s guidance) created this incredible cocktail that harkens back to a time when a “proper” lady would never order whiskey in public but rather a Spot of Tea — a potent beverage disguised as a simple refreshment. This week Logan served it up for our St. Patrick’s Day tour and reminded us just how deliciously simple it is. Stir until chilled and serve up in a teacup. Garnish with a slice of lemon. PRO TIP: Greenspot whiskey was created by Mitchell and Sons, a purveyor of whiskey and tea — the perfect whiskey for this cocktail. Aaron’s twist on an Old Fashioned was inspired by his childhood crush, Ginger Grant, and proved to everyone on the tour that not all three-hour tours end badly. Combine the first four ingredients in a shaker and and shake until cold. Strain over a large ice cube in a rocks glass and top with ginger beer. Express orange peel over the cocktail and rim of the glass. PRO TIP: Sing the Gilligan’s Island theme song while making this delicious cocktail. Brothers Drake had a Valentine’s Day inspired craft cocktail menu with several great mead cocktails with somewhat racy names. The Safe Word was a delicious and unique cocktail that utilizes three different Brothers Drake meads. Combine all ingredients in a shaker and roll three times throwing from one side of the shaker to the other. Strain and serve up in a chilled coupe and garnish with a sprig of burnt rosemary. PRO TIP: After burning the rosemary place on a dish and cover with the coupe to impart the aromas into the glass. Last weekend Logan created a welcome punch that warmed and won the hearts of all of our guests. Mix all ingredients in a pre-heated mug and garnish with a dehydrated lemon wheel. PRO TIP: To make the Cascara Pisco combine 1 bottle of Macchu Pisco with 40 g Cascara (the dried hull of coffee cherries). Sois Vide for 2 hours at 55°C and strain. To make mulled wine, Ina Garten has a delicious recipe here. Shea let us be guinea pigs for her and shared one of her cocktails from her next pop-up cocktail dinner at The Table — Under the Table. Combine all ingredients and shake until chilled. Serve up in a coupe glass. PRO TIP: Garnish with a slice of jalapeño. You can use a kitchen torch char the edges. Last weekend Jillian created a few seasonal favorites and won fan favorite two nights in a row. Combine all ingredients except the prosecco and stir over ice until chilled. Strain and serve on the rocks and top with prosecco. Garnish with fresh cranberries, star anise and dehydrated orange slices. Jillian created a few seasonal favorites. Combine all ingredients and stir over ice until chilled. Strain and serve on the rocks. Garnish with a sprig of rosemary and fresh cranberries. PRO TIP: Fresh herbs give any cocktail a wonderful fresh aroma. Kyle wowed the crowd with this complex and beautiful cocktail to start off our tour. While there were several delicious cocktails that followed No Monkey Business was not messing around and won our fan favorite. PRO TIP: Banana du Brésil has a very distinct and strong flavor — a little goes a long way so be careful not to overpower your cocktail with it. Garry prepared this amazing smoked cocktail from Denmark’s latest seasonal menu and all agreed it was the fan favorite. Combine all ingredients and shake until cold. Smoke and serve up in a coupe and garnish with a whole dried peperoncino. PRO TIP: There are several ways to smoke your cocktails at home. Whiskey Advocate has some great tips here. As he was preparing to be a contestant on I’m Not “Really” a Bartender, Barry Chandler worked with Logan create a margarita using Irish whiskey. Together, they developed an amazing cocktail and Barry told a wonderful tale of love and bridging cultures. Mix all ingredients and shake until cold. Serve up in a coupe and garnish with a slice of salted purple potato. PRO TIP: We suggest making your own agave syrup and squeezing fresh lime juice. All of your cocktails will be better with fresh ingredients and it isn’t as hard as you think. It was an absolutely amazing scene to be greeted in the grand lobby of the Westin Great Southern Hotel with this delicious twist on a classic champagne cocktail. Combine the vodka and simple syrup, chill over ice, and strain into a champagne flute. Add chilled prosecco and garnish with a Luxardo cherry. PRO TIP: For those who prefer a sweeter version of the 1897, add a dash of Luxardo cherry juice. Chris shared this delicious variation of the classic negroni. He also shared tales of cocktails, sobriety, service, and how every so often, some people might defile your restroom. Combine the Campari and sweet vermouth and stir until cold. Serve up or on the rocks, top with prosecco and garnish with a twist of orange. PRO TIP: dehydrating orange slices makes a beautiful and fragrant twist on the traditional garnish. From our podcast, If This Bar Could Talk, Episode 4: Girl Power. Jillian chatted with us about being a woman in the bar industry and blew us away with her simple yet delicious cocktail inspired by a cocktail she had at Porco Lounge in Cleveland. Combine Angostura, lemon juice and simple syrup and shake until cold. Pour into a Collins glass filled with ice and top with club soda. From our podcast, If This Bar Could Talk, Episode 3: Cocktologist. First, Garry and Francisco created something off their latest menu. At the time of taping this cocktail was still unnamed and the topic of much debate. Then, Garry and Francisco made us Denmark spin on a Negroni which has made its way back onto their menu. Combine all ingredients and stir until chilled (45 – 60 seconds) and serve either up. Garnish with fresh grapes. Next, Francisco created one of his cocktails from their latest menu. This delicious cocktails utilizes several unique ingredients from Japan and the name references an Anime classic. Shake all ingredients and serve up in a rocks glass. Garnish with lemon peel. Lastly, Garry and Francisco shared Denmark’s twist on a Manhattan which has become one of the most popular drinks on their menu — and with good reason. Combine all ingredients and stir until chilled (45 – 60 seconds) and serve either up or in a rocks glass with one large cube. This simple cocktail was the perfect end to our Sunday Funday tour. The Table’s unique garnish was what put this cocktail over the top to win fan favorite. Shake and double strain into a coupe. Garnish with a pickled honeydew melon. PRO TIP: Here’s an easy recipe to pickle you own melon. Barbara gave us a sneak preview of The Bottle Shop’s fall menu and wowed one and all with this refreshing cocktail. Utilizing two types of gin gave this cocktail a lot of character and complex flavor. Shake everything but the Topo-Chico. Serve in a tall Collins glass, top with the sparkling water and garnish with a sprig of fresh mint. From our podcast, If This Bar Could Talk, Episode 2: Haunted Tavern. Seth shared his favorite whiskey cocktail with us. This classic twist on the Manhattan from the 1930s adds depth and complexity to this deliciously balanced cocktail. Combine rye, vermouth and Cherry Herring and stir until cold. Rinse a coupe or cocktail glass with absinthe and pour out the excess. Strain the cocktail using a Hawthorn strainer and garnish with a Fabbri amarena or Luxardo maraschino cherry. From our podcast, If This Bar Could Talk, Episode 1: Master of Spirits. Cris created a traditional French 75 using Cognac as they did originally at the French 75 Bar at Arnaud’s Restaurant in New Orleans. This marked both The Citizen Trust’s first time on the tour and winning fan favorite. Everyone was in awe of the craft and technique used to create this delicious cocktail. Shake everything but the soda. Pour over fresh rocks, top with soda, and garnish with a basil or mint leave. Shake all ingredients hard and strain over fresh ice. Garnish with a lime wedge or mint leaves. This delicious cocktail is one of Denmark on High's house concoctions. 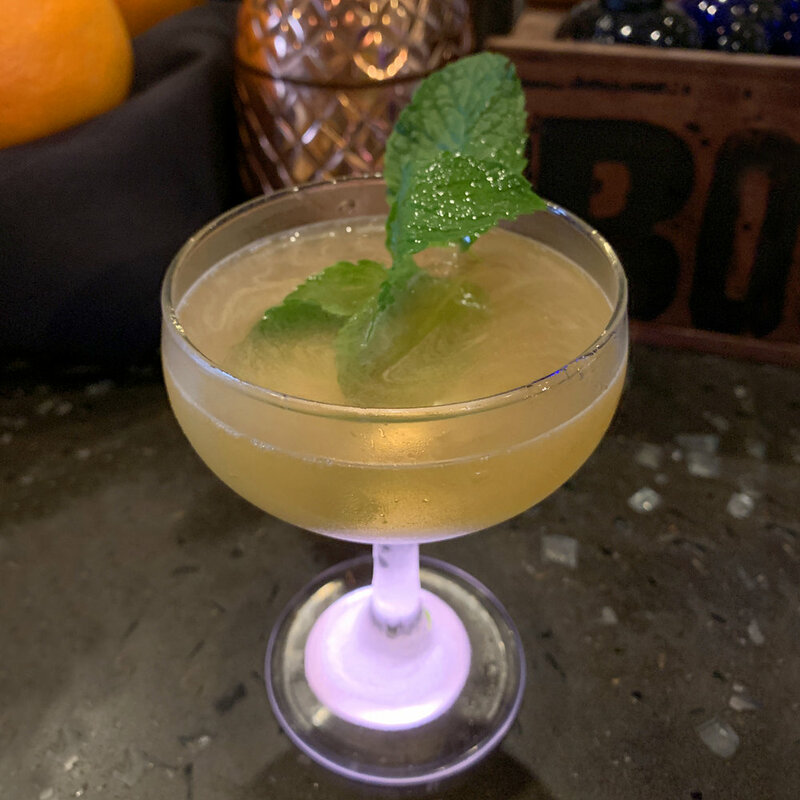 Inspired by the Last Word, the Other Side features Old Tom gin and utilizes Denmark's house-made garden tincture, made with fresh basil, thyme, mint, and oregano. Shake and double strain using a Hawthorn strainer and pour the cocktail through a mesh strainer to remove all of the ice. Serve up in a coupe or cocktail glass. PRO TIP: Making your own tincture is easy and just a couple of dashes really add a lot of flavor to any cocktail. Just look at the ingredients and you'll immediately see why this is called the Pick Me Up. Jen served this with the Table's fresh peach upside-down cake for a perfect flavor combination and end to tour to become this week's fan favorite. Shake until cold and serve up in a chilled coupe glass. PRO TIP: Visit Backroom Coffee Roasters in Galena, OH or you can find their coffee at several fine local retailers. This riff on the classic Pimm's Cup was a great end to the tour and the perfect blend of flavor and presentation. Shake, strain and top with soda. Garnish with cucumber ribbon, mint sprig and fresh strawberry. PRO TIP: The garnishes are as important as the drink with a Pimm’s Cup — don’t skimp on fresh produce! This week's fan favorite checked all the boxes and hit all the right notes — boozy and complex yet balanced and with just a hint of the tropics. Combine all ingredients except for the Grenadine and shake over ice to chill. Serve in a rocks glass with one large cube and float the Grenadine near the edge of the glass so it settles at the bottom of the cocktail. Garnish with a fresh pineapple wedge and a sprig of mint. PRO TIP: Instead of buying Roses (or other) Grenadine, make your own syrup by combining equal parts of Pom or other natural pomegranate juice and sugar and reducing it over heat. This refreshing cocktail was week's fan favorite. It was as delicious as it was beautiful and as the name suggests took us all away to a tropical place. Add all ingredients in a blender and blend until smooth. Despite several strong contenders, James' Stockyard Pony hit all the right notes with our guests and came out on top this week to winner fan favorite. Build this refreshing cocktail over ice in a rocks glass and stir and garnish with lemon peel. PRO TIP: Try this by substituting the Aperol with Campari, Cappelletti, or any other italian bitter aperitivo for an interesting new version of your own. El Gato (Garry) created this refreshing cocktail on the fly and our guests helped name it. Combine all ingredients in a mixing glass, add ice and shake until chilled. Serve over fresh ice in a Collins glass and garnish with lime. PRO TIP: Rub lime on the outside of one half of the glass to salt the rim, this prevents the salt from falling into your cocktail and gives you options while you are sipping the cocktail — salt or no salt. Delicious, smooth and boozy — this variation on an Old Fashioned hit all the right notes. PRO TIP: Practice makes perfect when lighting orange peels on fire — it's all in the wrist. This cocktail is a new addition to the Service Bar menu and Gerad wowed us with his custom smoke infusion dome. Boozy, complex, perfectly balanced, slightly smokey, and a beautiful presentation — the Spruce Lee checks all the boxes. Combine all ingredients in a mixing glass, add ice and stir until chilled. Pour over one large artisanal ice cube and infuse with smoke. PRO TIP: Get into Service Bar and watch their skilled staff serve up this impressive cocktail. You'll be gad you did. This is the second time this classic cocktail has won fan favorite and two different bars used the exact same brands of ingredients. 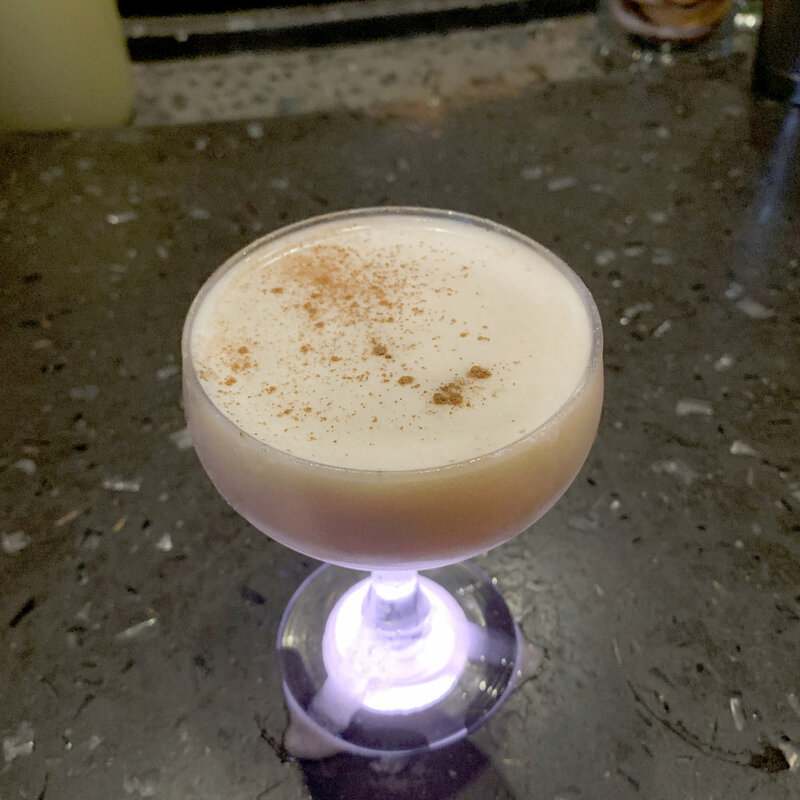 This delicious scotch-based cocktail, named after a silent movie about bullfighting, surprised and delighted even the non-Scotch drinkers — or at least until now, they didn't think they'd enjoy a drink made with Scotch. Shake and serve up in a coupe or cocktail glass and garnish with a twist of orange peel. PRO TIP: Using the brands listed obviously makes a difference. The Bottle Shop's tiki-inspired riff on the modern classic the Penicillin Cocktail was an instant hit and cured all that could have possible been ailing anyone — the perfect cocktail for the height of flu season. Combine all ingredients in a shaker, shake lightly and serve over crushed ice. Garnish with fresh mint, a Luxardo cherry and candied ginger. PRO TIP: A light shake with ice helps to mellow out the viscosity and spice of this drink, but remember that crushed ice will do most of the diluting for you. This aptly named cocktail (Italian for wintry welcome) warmed the souls and won the hearts of our guests. It was the perfect finish to a tour on a frigid January evening. Stir over ice, strain, and serve in a rocks glass over one large ice cube. Garnish with a sprig of fresh rosemary. PRO TIP: Get into Denmark and order this delicious cocktail while it's on their seasonal menu. In this riff on the classic cocktail, Adele substituted the sweet vermouth with Watershed's Nocino, a black walnut liquor, that created a complex and beautifully balanced cocktail that became this week's fan favorite. Stir ingredients over ice, strain, and serve in a rocks glass over one large rock. Garnish with orange peel. PRO TIP: Although the classic negroni calls for equal proportions of the three ingredients, Adele doubled the amount of gin to compensate for the bold flavors of the Nocino liquor. Although it was created only a few years ago in New Orleans by Chris Hannah of Arnaud's French 75, this delicious cocktail is quickly becoming a modern classic. Stir ingredients over ice, strain, and serve up in coupe or cocktail glass. Garnish with orange peel. PRO TIP: Jordan impressed us all and upped the ante for this cocktail by flaming and expressing a lemon peel over the cocktail. The Gold Rush is a modern spin on a classic whiskey sour (or is it a whiskey version of the Bee's Knees? It's hard to say). Jen added Cointreau to her cocktail to bring out the citrus flavors and add a little more sweetness and topped it with a splash of soda to create a boozy, yet refreshing, fan favorite. Build in a rocks glass, stir and top with a splash of soda. PRO TIP: Honey syrup can be made at home the same way you'd make simple syrup. 1:1 (water to honey), bring to a boil and let cool. Heather shared a new cocktail with us which will appear on Thurber's fall menu. She asked our guests to help her come up with a name and after several ideas they landed (for now) on Snap-teaze — referencing the ginger snap cookie and tea flavors that are so beautifully balanced with the rye in this cocktail. Build in a rocks glass and garnish with candied ginger. PRO TIP: You can bring out some additional amazing flavors by using black walnut or orange bitters instead of Angostura. Garry created this unique cocktail for our birthday girl and it still needed a name, hence the Pamala! Fruity and delicious, the Pamala was our final cocktail of the tour and an immediate fan favorite. Combine all ingredients, shake and double strain into a rocks glass. Add one large ice cube and garnish with fresh blueberries. PRO TIP: Fresh and house-made ingredients are key to this cocktail. They could be substituted but get into Denmark on High and ask for this cocktail by name, you can thank us later. 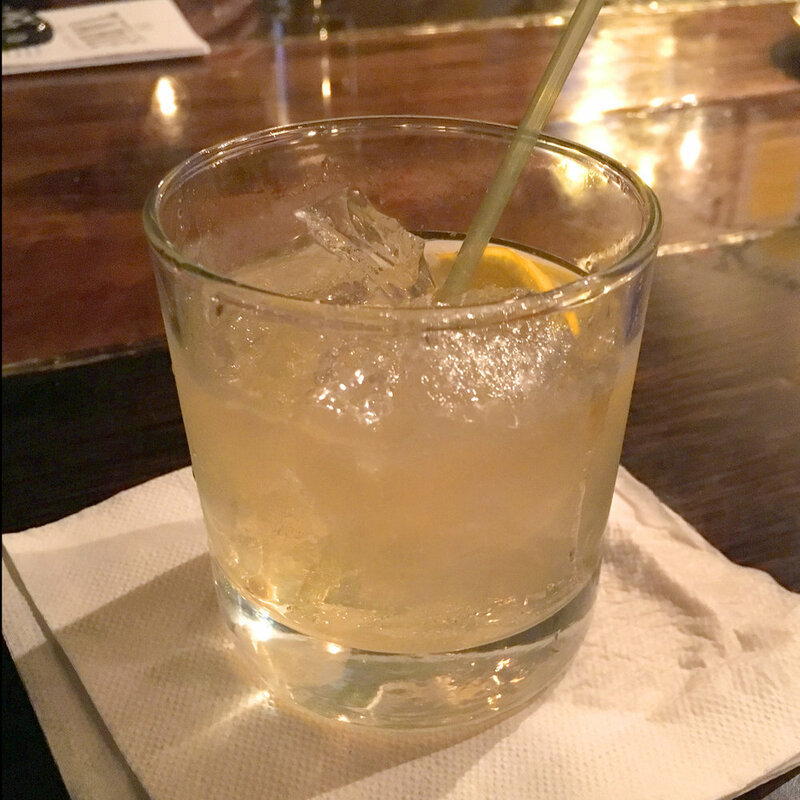 Seth started our tour with one his original recipes — the Court Reporter. 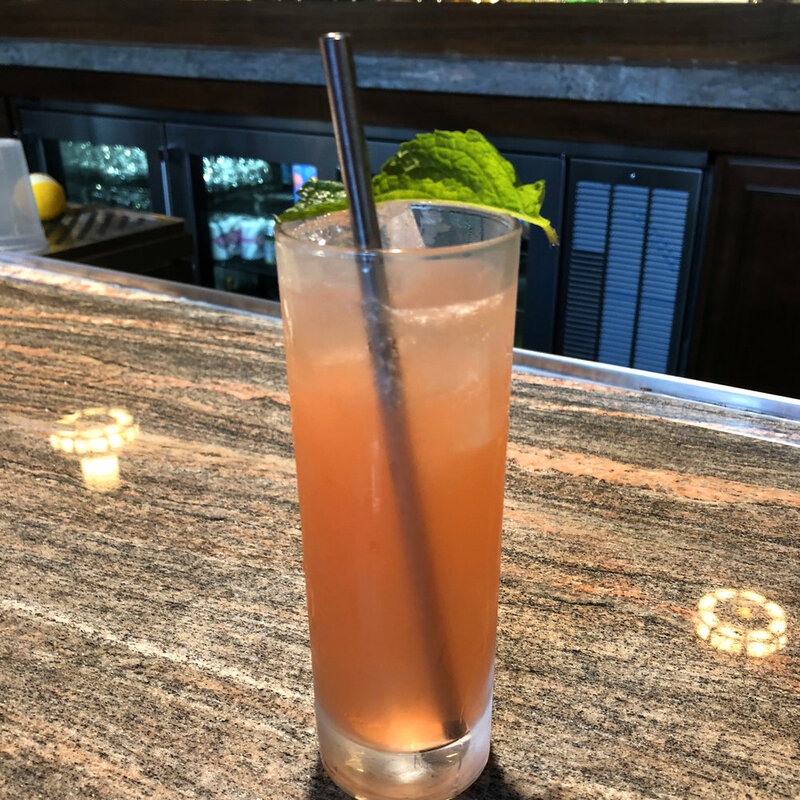 Despite having several other wonderful cocktails on the tour, this refreshing cocktail was so delicious that it stayed on the minds of all of our guests and became this week's "fan favorite". Combine all ingredients, shake and strain into a flute or coupe and top with pink bubbles. PRO TIP: Do not use peach schnapps instead of peach liquor, the low quality will be noticed. Also, homemade tonic, while preferred, is not required — most good liquor stores will carry tonic syrup. This classic cocktail is refreshing and light and stole the hearts of many who thought they wouldn't like a cocktail made with egg whites. It dates back to pre-prohibition times and is still a classic for a very good reason — it's delicious! PRO TIP: Heather used Watershed Four Peel Gin to enhance the citrusy finish of this cocktail. Sami started our tour with this delicious twist on the classic French 75. Shake and double strain into a flute and fill with sparkling wine. 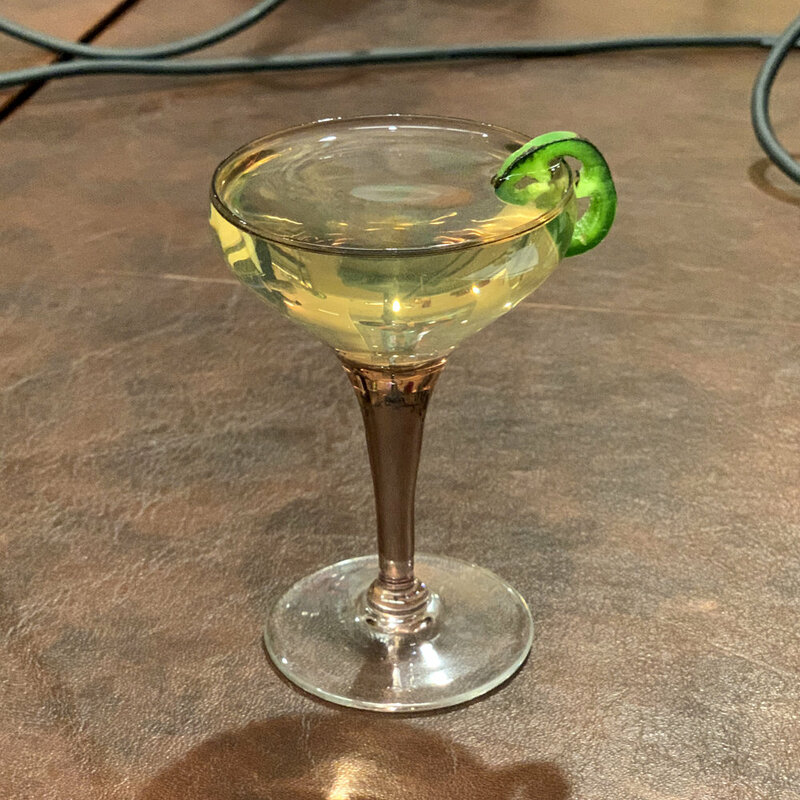 This refreshing tequila-based spin on the classic Last Word was our first cocktail of the tour but stuck in everyone's mind to win as our Sunday Funday fan favorite. PRO TIP: The lime juice was particularly tart so .25 oz of simple was needed. Adjust amount to taste. Barbara served up classic Manhattans three ways to showcase the importance of the main ingredient — whiskey, and show how it influences the cocktail. While the bourbon and scotch versions were enjoyed, it was the rye that stood out and won as fan favorite. Stir* ingredients over ice and serve up in coupe or cocktail glass. Express the lemon peel over the cocktail and garnish with Luxardo cherries. PRO TIP: Splurge and get these exact ingredients for your bar. You can thank us later. *A proper Manhattan should never be shaken. Shake and serve up in a coupe or cocktail glass. PRO TIP: Use a mister to spray the Absinthe over a chilled glass before pouring the cocktail. This will help control the amount of Absinthe in the drink as well as incorporating it in the cocktail. Originally published in the Savoy Cocktail Book, this classic cocktail is said to have been created by a man who nearly died of a fever and gave this recipe to the doctor who saved his life as a token of his appreciation. Shake and serve up in a cocktail glass and garnish with a Luxardo cherry or twist of orange peel. PRO TIP: for your garnish, wrap an orange peel around the cherry and skewer both together. Named after a Rudolph Valentino movie about bullfighting, this classic Scotch cocktail is delicious when it's perfectly balanced but can easily fail, so precise measurements are a must. PRO TIP(s): Using the brands listed makes a difference. and buy a bottle of Cherry Herring now while you can still find it in Ohio. This incredible cocktail was so perfectly balanced that it won the hearts, and tastes, of our guests — who didn't think they liked gin, until they tried Seth's Plea Deal. Build the cocktail in a rocks glass. Garnish with a sprig of fresh dill. PRO TIP: Add ice to glass at the end so as to not dilute the drink too much. Simple. Classic. Refreshing. Delicious. And perfect for a hot summer afternoon. Shake and serve up in a chilled cocktail glass or coupe. Garnish with a slice of lime. PRO TIP: Ty served up this classic cocktail by double straining it: using a Hawthorn strainer and pouring the cocktail through a mesh strainer to remove all of the ice. This classic cocktail has been enjoyed since the 1920s and for good reason — it's delicious! Shake and serve up in a chilled cocktail glass or coupe. Garnish with an orange peel. PRO TIP: The classic Sidecar recipe is a simple 2:1:1 proportioned cocktail. Ian upped the booziness with more Cognac. Save money and use VS Cognac for this citrusy cocktail. This delicious and complex cocktail was created by Francisco for Denmark's Summer cocktail menu. Shake with ice, infuse smoke and serve neat in a chilled rocks glass. Garnish with dried mango and pineapple. PRO TIP: unless you own a smoke gun, go to Denmark while this amazing cocktail is still on the menu. 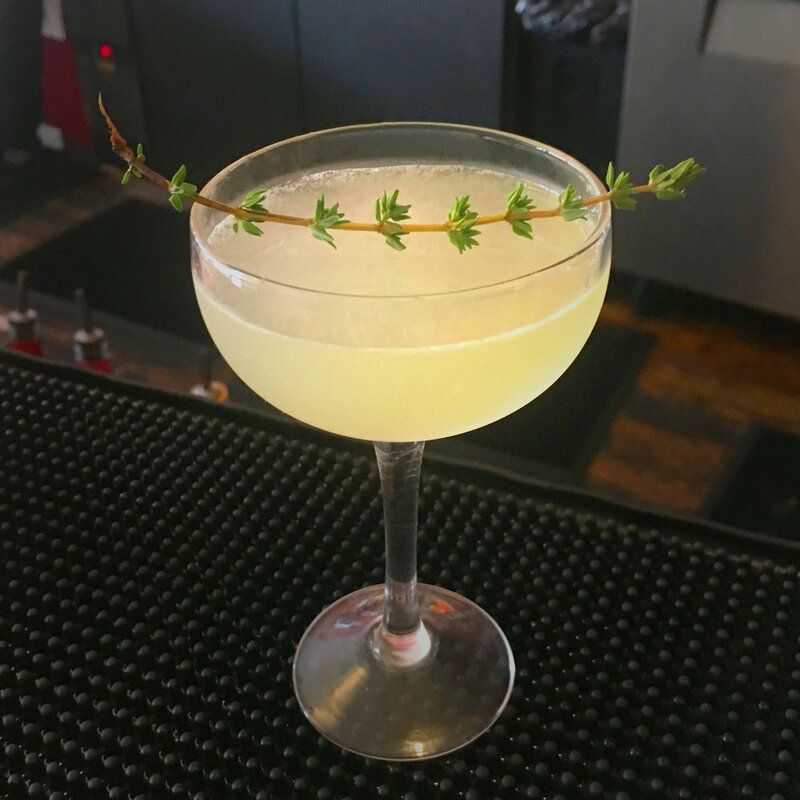 This refreshing cocktail was created by Dom as a tribute to Earth Day 2017. Muddle 3 slices of cucumber and arugula in a rocks glass and fill with crushed ice, In a shaker, combine all ingredients, add ice and shake until cold. Strain and garnish with the remaining cucumber slice and fresh-ground black pepper.